Talent is nurtured at an inspiringly young age; from a primary level, students are comfortable in working with technology. The brightest are afforded opportunities in the ICT stream, where over 85,000 are currently employed. This army of consultative and customer-oriented talent, growing by 20% year on year, is highly adaptable, innovative, and conversant in English - the country’s predominant business language. 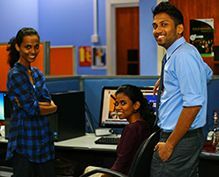 Competency Development Programs are held at a national level which, through focused training, has paved the way to take Sri Lanka to its visionary Center of Excellence (COE) status in key areas. In addition, the country’s healthy business environment spells even more success for interested investors. Overall infrastructure (including power, modern utilities, roads, and telecommunications and office space) is favorable compared to the other nations and surpasses international standards through its cost-effective rates. Sri Lankans are multi-lingual and multi-cultural, understanding and appreciating international cultures. Mixing business and pleasure has never been this easy; for the discerning expatriate professionals or frequent business traveler, Sri Lanka offers the best of both worlds.